This DVD-supported course helps Christians to fully grasp the truth of who they are in Christ, get rid of the spiritual baggage that holds them back, and claim the freedom that is their inheritance. Now, reshot in High Definition, it includes seven and a half hours of presentations that can take the place of presentations by the course leader. 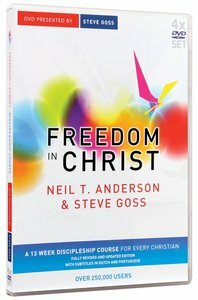 About "Freedom in Christ Course Remastered Edition (Freedom In Christ Course)"